Surgery is not simply a medical procedure. Surgery can also be a dissection – when absent of an intent to treat and correct, the procedure becomes a hungry curiosity to examine and investigate. At its purest, a dissection intricately probes to behold the internal. Kobylarz practices this surgery of delicate incisions in his mélange. The essence of a miscellany of diverse things is not merely to catalog a wunderkammer of everyday objects, but moreover to hold up a double mirror: one to reveal the interior lives of objects, and another to reflect the depths of their creators and owners. Kobylarz’s poetry may initially elevate the mundane, but its deepest design is to ask what the human possession divulges about the human being. The quotidian isn’t only ecstatic; the quotidian is a book of revelations. 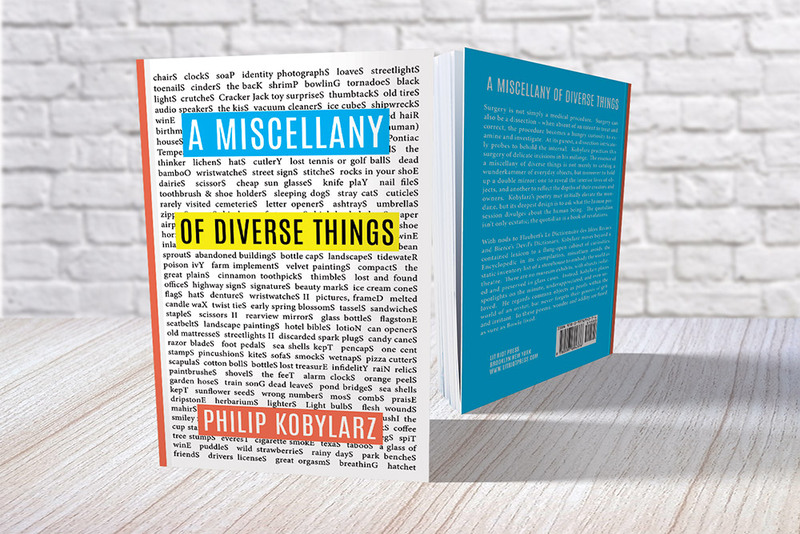 With nods to Flaubert’s Le Dictionnaire des Idées Recues and Bierce’s Devil’s Dictionary, Kobylarz moves beyond a contained lexicon in A Miscellany of Diverse Things to a flung-open cabinet of curiosities. Encyclopedic in its compilation (more than 400 entries in this volume), miscellany avoids the static inventory list of a storehouse to embody the world as theatre. There are no museum exhibits, with objects isolated and preserved in glass cases. Instead, Kobylarz places spotlights on the minute, under-appreciated, and even unloved. He regards common objects as pearls within the world of an oyster, but never forgets their genesis of grit and irritant. In these poems, wonder and oddity are fused as sure as Bowie lived. Philip Kobylarz is an itinerant teacher of the language arts and writer of fiction, journalism, poetry, book reviews, and essays. He has been a journalist, a film critic, a veterinarian’s assistant, a deliverer of furniture, and by default, an ascetic. His work appears in such publications as Paris Review, Poetry, The Best American Poetry series, Massachusetts Review, andNew American Writing. His first book, Zen-inspired poems concerning life in the south of France, is entitled rues. His second book, short stories and a novella, is titled Now Leaving Nowheresville. His book-length essay about the city of Marseille & Provence that is a response to Baudrillard’s seminal text America is forthcoming from Truth Serum Press of Adelaide, Australia. He lives ever so temporarily in the east bay of San Francisco.